Oh India... I'm sorry you have such a crappy country that you have to work all day spamming websites with your superlative use of English grammar..... Sigh. Just a few of the new ones this morning.... thought I'd post them here because I'm sure not letting them through my spam filter with links back to them! Ha ha. I am sure this paragraph has touched all the internet viewers, its really really pleasant paragraph on building up new web site. on UPDATED: What Is Almond Bark? Hello there, You've done an excellent job. I will definitely digg it and personally suggest to my friends. I am sure they will be benefited from this website. on UPDATED: What Is Almond Bark? It's a typical day around here and I just popped into the laundry room to check on the dryer and found it was finished. Without thinking about it I opened the door and started to grab warm clothing out and folded it, dropped into the basket and put a new load of wet clothes into the dryer. I never thought about this as a helpful hint before... but then again 'laundry' has never been a big issue in our home. Even at our busiest with full time jobs, kids in school, sports, dance, choir, band, part time jobs... as hectic as life can get, laundry was never really an issue in our home. Yet, I realize it's kind of an issue for some people. I personally know two people who always "were going to fold that...." but I don't think I've ever been in their home when their couch or bedroom was filled with piles of laundry that will never, ever actually be folded. And if you don't care about folding laundry that's cool. But if you do care, but can't seem to get a handle on it... well, here is one way that might help. When I was a newlywed (a billion years ago) I started to fold straight out of the dryer. I've never done any differently... and as our family grew and got insanely busy and grew more and got even crazier with schedules... this is something that still never changed. The SHORT version is simply: Do NOT take the clothes from the dryer and toss them into a basket. Ever. Always always always fold straight from the dryer to the basket no matter what. If you get them while they are still hot/warm it's very likely you won't even have to iron anything. Shirts straight from the dryer and folded look pretty good and rarely need ironing unless they are 100% cotton (in which case I often 'hang' them on a hanger straight from the dryer after giving them a good snap or two with my wrists to shake them out first. It does not take 'too much time'. It's going to take about 5 minutes tops. And guess what? It's DONE. No piles on the couch, on the bed, on the floor or in the basket waiting for you. The longer version: I have 4 hamper bins in the laundry room*. One for whites, one for dark blues and blacks. One for reds and one for green, gray, browns. Clothes are sorted into these bins and not all thrown in one huge dirty hamper. When I need to throw in laundry I grab a basket, dump in the washer and turn it on. No wasted time sorting since it's all done as dirty clothes are brought into the laundry room. When the washer is done I transfer for the dryer and turn on. If I'm going to be home longer or I'll be home in about an hour to get the wet clothes out, I grab a new colored bin and toss it in. When the dryer is done and the clothes are still warm, I fold straight from the dryer quickly. Even if I have something else I want to do or get to NOW - I make myself finish folding. It takes less than 5 minutes and I know I don't want to do half a job and 'plan' to get back to it. I finish. If I am gone or get busy and the clothes have cooled down, I often fold anyway if they are everyday clothes, t-shirts, things that don't need creases or light ironing. If they DO then I turn the dryer back on for a few minutes to get the clothing hot again. Then I fold straight from the dryer. Some people won't like this way. Some people have other ways that work for them and their busy families. But someone, somewhere, might think; You know, I'm going to do this! And it might help. I also just smiled as I typed this because the two kids that DO fold straight from the dryer also adapted my way of hanging up clothing in the closet.... by color and kind. Jeans in one area together, then pants, skirts & dresses, and then on to the shirts/tops. Which are all arranged by color kind of like a rainbow. So if I need a green shirt or an orange shirt, I can see exactly and quickly what I need and where it is. But I guess that's a post for another day! *Related Product: I was going to check Amazon for some links on laundry hampers and saw this on my first search return. This is MY folding hamper. In the post above I mentioned that I have 4 containers in our laundry room for dirty clothes. They are reds, whites, blue/blacks and green/brown/gray. This is the hamper I use - which I bought through Walmart but they are now available through Amazon as well. Using Krylon ColorMaster spray paint on old vases to repurpose into a rustic and twine cream vases! Just a quick fly-by post here as I'm busy doing a lot of crafts, fix-its, repairs, maintenance, cooking, etc but I admit; I'm failing miserably at keeping up with my websites! This is a spur-of-the-moment 'quick' craft I did as I'm slowly trying to update our home to more neutral colors... without actually having a budget to work with! Originally these vases were a set of 3 I bought on clearance at Kirklands many years ago - back when that whole 'Tuscany' look was popular and the shiny lacquered look in spicy reds, dark greens and blacks with gold accents was the perfect accent to my matching rugs. I think I donated those rugs almost 7 years ago but I've kept the vases around knowing that someday I'd use them.... and that day came last month! I already had paint leftover from the brown hutch I refinished, as well as the tall floor vase I spray painted as well. Now, it was time to do the vases. To finish them off, it just so happened I bought a few sets of 3- galvanized and chalkboard planters on clearance from Lowe's and in the packaging was some burlap they used to wrap around the planter stakes and chalk that came with the set. I had the burlap pieces sitting on the counter so I grabbed them, wrapped them around the top of the vases and added a bit of twine from the 'junk' drawer. I love the simple cream and burlap/twine look! Burlap is pretty cheap so even if you have to buy a roll of burlap ribbon at Michaels or the Dollar Store it won't cost much and you only need a bit so you can save the rest for another craft. OR if you've made a burlap wreath, you might already have some on hand. If you don't - you can also wrap the twine around numerous times to cover the neck of the vase with it. Another popular look. I like Rust-o-leum spray paint but I had Krylon on hand which worked great for this project. This is a photo from the snapchat I sent my 2 daughters to show them the painted vases... hence the caption on the picture! Ha ha. 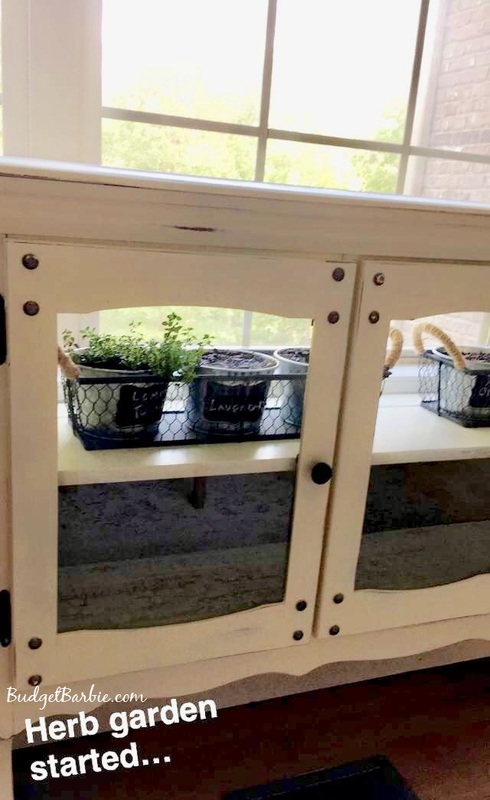 Remember the post in June where I spray painted an old hutch I bought at a thrift store for $14.99? I wasn't sure what I was going to use it for at the time but I figured for the price, it didn't matter. When I had it 'done' (or what I thought was done at the time), I just didn't know what it wanted to be and I wasn't thrilled with it just hanging out in my dining room.... it looked like it needed a purpose. So this past week I used sand paper to 'distress' the finish a bit; then went to Lowe's and found some herbs and herb seeds as well as a great deal on these fabulous galvanized tins that come with a planter box with chicken wire and little chalk board area's to write the plant name on... (on clearance right now in their indoor lawn and garden center - but they probably are selling fast because they are that cute!). Now my little vintage looking hutch has a purpose in life... or least for this fall and winter. Then he may get moved into the laundry room - because I've been wanting to redo the laundry room for quite some time and it's getting closer to me actually getting it done instead of just sighing and thinking "I really need to redo this space..." every time I walk into it.